I want to scale up several identical objects and I want these objects to remain exactly a the same initial place. 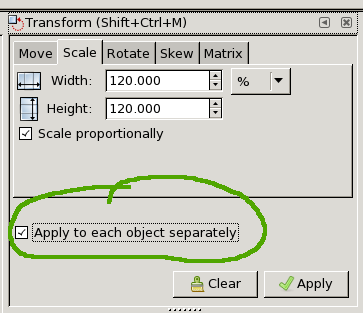 When I scale up a selection of objects, they move to the proportion of the scale I indicated, in the larger box of the selection, this is not what I want. Ungroup your objects, if needed. Object → Transform → Scale. Select the desired scaling factor. Check apply to each object separately. This is something I do fairly frequently. While Wrzlprmft♦ provided an answer that works, it's a real pain if you have lots of objects. But the solution is actually very easy (using Inkscape 0.92). I like to use very modest scale amounts and apply again and again until I reach the desired size. Since it's vector graphics, no information is lost each iteration (unlike bitmap graphics programs). As your objects are identical you should consider making clones for your duplicates. Scale or otherwise redefine your parent object and watch the children follow suit. The advantage of this approach is that you don't have to explicitly select all of the instances - they all get updated. Although there is a way to select the parent of a child object I find it more straightforward to create my parent objects off the page for simpler direct selection. Of course my answer presumes that you want to scale all of your objects - if not you can always start out with clones and unlink those that you don't want affected by subsequent edits to the parent. Not the answer you're looking for? Browse other questions tagged inkscape resize selections or ask your own question.